The Vitae/Lives of the Monk Onuphrios the Great and of other hermits of the IV Century, asceticising in the inner Thebaid wilderness in Egypt (among them were the Monk Timothy the Wilderness-Dweller, and the Monks John, Andrew, Herakleimon (Heraklambonos), Theophilos and others) – was written down by their contemporary and fellow monk of the Thebaid, the Monk Paphnutios. One time the thought occurred to Saint Paphnutios to go off into the depths of the wilderness, in order to see for himself the fathers asceticising there and to hear from them, as to how they sought after salvation. He set out from his monastery and went into the wilderness. Over the span of four days the monk reached a cave and found in it the body of a long since dead elder. Having buried the hermit, the Monk Paphnutios went on further. After another four days he came across yet another cave and from the marks in the sand he realised, that the cave was inhabited. At sundown he saw an herd of buffalo and walking amidst them a man. This man was naked, but covered over literally as though by clothing by long hair. This was the Monk Timothy the Wilderness-Dweller. Catching sight of a fellow man, the Monk Timothy thought that he was seeing an apparition, and he began to pray. Saint Paphnutios finally convinced the hermit, that he was actually a live man and a fellow Christian. The Monk Timothy readied him a guest-place and related, that he had been already asceticising in the wilderness for 30 years, and this was the first he had seen of another man. In his youth, the Monk Timothy had lived in a common-life monastery, but he was troubled by thoughts of being saved alone. The Monk Timothy left his monastery and went to live nearby a city, sustaining himself by the work of his own hands (he was a weaver). One time a woman came to him with an order and he fell into sin with her. Having come to his senses, the fallen monk went far off into the wilderness, where with patience he underwent tribulation and sickness as a merited chastisement from God. And when he was already at the point of dying from hunger, just then in a miraculous manner he received healing. From that time the Monk Timothy had lived peacefully in complete solitude, eating dates from the trees, and quenching his thirst with water from a spring. The Monk Paphnutios besought the elder that he might remain with him in the wilderness. But he was told, that he would be unable to bear the demonic temptations which beset wilderness-dwellers, and instead he blessed him and supplied him on his way with dates and water. Having rested up at the wilderness monastery, the Monk Paphnutios undertook a second journey into the depths of the wilderness. He went on for 17 days. His supply of bread and water was exhausted, and the Monk Paphnutios twice collapsed from weakness. An Angel strengthened him. On the 17th day the Monk Paphnutios reached an hilly place and sat down to rest. Here he caught sight of a man approaching him, from head to foot covered with white hair and with a belt of leaves about the loins. The sight of the elder frightened Saint Paphnutios, and he jumped up and fled off towards the hill. The elder sat down at the foot of the hill. And when, lifting his head, he caught sight of the Monk Paphnutios, he called out to him to come over. This was the great wilderness-dweller – the Monk Onuphrios. At the request of Saint Paphnutios, he told him about himself. The Monk Onuphrios had lived in complete isolation in the wilds of the wilderness for 60 years. In his youth he had been raised at the Erita Thebaid monastery. Having learned from the elders about the hardships and lofty life of the wilderness-dwellers, to whom the Lord dispatched help through His Angels, the Monk Onuphrios blazed up in his spirit to copy their exploits. By night he secretly left the monastery and saw before himself a ray of light. Saint Onuphrios became frightened and decided to go back, but the voice of his Guardian Angel urged him on upon his utmost path. In the depths of the wilderness the Monk Onuphrios came upon a wilderness dweller and he stayed with him to learn of the wilderness manner of life and the struggle with demonic temptations. When the elder was convinced, that Saint Onuphrios was strong enough in this terrible struggle, he then led him off to this bidden place of exploits and left him alone. Once a year the elder was wont to come to him, and after several years, having finally come to the Monk Onuphrios, he then died. At the request of the Monk Paphnutios, the Monk Onuphrios told about his exploits and efforts and about how the Lord had cared for him: roundabout the cave where he lived, there grew a date-palm tree and a spring of pure water issued forth. Twelve different branches of the palm tree in succession bore fruit, and so the monk endured neither hunger nor thirst. The shade of the palm tree sheltered him from the noonday heat. An Angel brought the saint bread and each Saturday and Sunday communed him, as also with the other wilderness dwellers, with the Holy Mysteries. The monks conversed until evening. At evening there appeared amidst the saints white bread, and they partook of it with water. The elders spent the night at prayer. After the singing of matins the Monk Paphnutios saw, that the face of the Monk Onuphrios had become transformed, which frightened him. Saint Onuphrios was saying: "God, Merciful to all, hath sent thee to me, so that thou might give burial to my body. On this present day I shalt finish my earthly course and pass over to life unending, in rest eternal, going to my Christ". The Monk Onuphrios bid Saint Paphnutios, that he should tell the account about him to his brother ascetics and to all Christians, for the sake of their salvation. The Monk Paphnutios besought blessing to remain in the wilderness, but Saint Onuphrios said, that this was not the will of God, and he ordered him to return to the monastery and relate to everyone about the lives of the Thebaid Wilderness-Dwellers. Having then blessed the Monk Paphnutios and made farewell, Saint Onuphrios prayed long with tears, and then he lay down upon the earth, uttering his final words: "Into Thine hands, my God, I commend my spirit", – and he died. The Monk Paphnutios with weeping tore off a portion of his garb and with it wrapped the body of the great wilderness dweller, which he placed in the crevice of a large rock, and in the semblance of a grave, he covered it over with a multitude of small stones. Then he began to pray, whether it was that the Lord had decided he should stay til his life's end at the place of the exploits of the Monk Onuphrios. Suddenly the cave fell in, the palm tree withered, and the water spring dried up. Realising that he had not been given the blessing to remain, the Monk Paphnutios set out on his return journey. After 4 days the Monk Paphnutios reached a cave, where he met a wilderness dweller, who was there in the wilderness for more than 60 years. Except for the two other elders, with whom he asceticised, this wilderness dweller had seen no one in that time. Each week these three had gone on their solitary paths into the wilderness, and on Saturday and Sunday they gathered for psalmody. They ate the bread, which an Angel brought them. And since it was Saturday, they had gathered together. Having partaken of the bread from the Angel, they spent the whole night at prayer. In leaving, the Monk Paphnutios asked the names of the elders, but they said: "God, Who knoweth all, knoweth also our names. Remember us, that we be vouchsafed to see one another in God's habitations on high". Continuing on his way, the Monk Paphnutios came upon an oasis, which impressed him with its beauty and abundance of fruit-bearing trees. And then the four youths inhabiting this place came to him from out of the wilderness. The youths told the Monk Paphnutios, that in their childhood they had lived in the city of Oxyrhynchus (Upper Thebaid) and they had studied together. They had been ardent with the desire to devote their lives to God. Making their plans to go off into the wilderness, the youths left the city and after several days journey they reached this wilderness area. A man radiant with light met them and led them to a wilderness elder. "We are living here six years already, – said the youths, – Our elder dwelt here one year and then he died. We live here at present alone, we eat of the fruit of the trees, and we have water from a spring". The youths gave him their names: they were Saints John, Andrew, Heraklambonos (Herakleimon) and Theophilos. The youths asceticised separately from one another the whole week long, but on Saturday and Sunday they gathered at the oasis and offered up common prayer. On these days an Angel would appear and commune them with the Holy Mysteries. This time however, because of the Monk Paphnutios, they did not go off into the wilderness, but spent the whole week together at prayer. On the following Saturday and Sunday Saint Paphnutios together with the youths was granted to commune the Holy Mysteries from the hands of the Angel and to hear the words of utterance of the Angel: "Receive ye the Food Imperishable, the Bliss Unending and Life Eternal, the Body and Blood of the Lord Jesus Christ, our God". The Monk Paphnutios made bold to ask of the Angel the permission to remain to the end of his days in the wilderness. The Angel answered, that God had decreed for him another path – to return to Egypt and to make report to all Christians about the life of the wilderness dwellers. Having made his farewell of the youths, the Monk Paphnutios after three days journey reached the edge of the wilderness. Here he found a small skete monastery, and the brethren received him fondly. 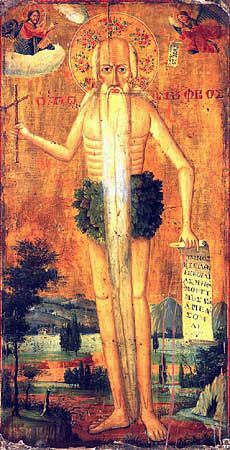 The Monk Paphnutios related everything, that he had learned about the holy fathers, whom he had encountered in the depths of the wilderness. The brethren wrote down in detail the account of the Monk Paphnutios and spread it about through other sketes and monasteries. The Monk Paphnutios gave thanks to God, Who had granted him to learn about the lofty lives of the hermits of the Thebaid wilderness, and he returned to his own monastery.